Add a stylish and professional finish to your gifts and parcels with Crystal Clear Shipping Labels. The labels are 100% transparent, so they blend into the background of your parcel or gift. They are durable (oil, dirt, splash and tear proof), so your parcel will arrive looking as professional as when it left your door. The labels can also be used on glass polished surfaces, plastic or metal surfaces. These glossy clear labels are compatible with laser printers and are Jam-Free™ making printer jams a thing of the past. The label format is 199.6 x 289.1mm with 1 label per A4 sheet and is an ideal size for applying to large boxes and parcels. 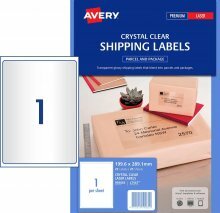 With our FREE and easy-to use software Avery Design & Print online, you can easily create your clear shipping labels. Whether you choose a pre-designed label template or start from scratch with your own design, you can trust our software to deliver smart, stand-out results.